Auralex’s ProPanels™ are available as wall panels and corner panels in Sandstone, Obsidian and 12 new premium color/fabric options. 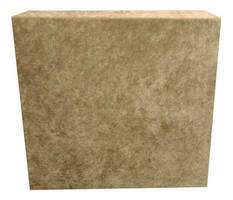 Units are offered in panel sizes of 2 x 2 ft, 2 x 4 ft with 1 and 2 in. 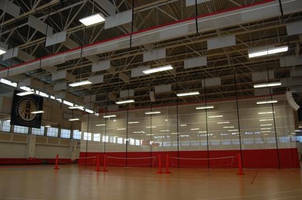 thickness and 4 x 8 ft and 4 x 4 ft panels with 2 in. thickness. ProPanels offer upscale look and reduces unwanted room reflections such as slap and flutter echoes. 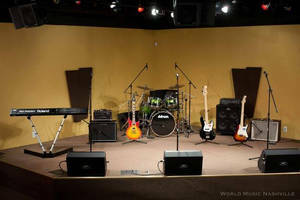 Units are used in commercial, house of worship or recording studio installations for absorbing sound. 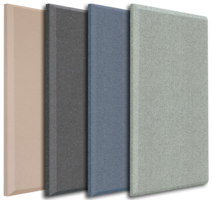 InfoComm, Las Vegas, NV, June 6, 2018 – Auralex® Acoustics, Inc. (booth C514), the world’s leading brand of acoustical treatments, is displaying new fabric color options for its line of ProPanel™ Fabric Wrapped Acoustical Absorption Panels. The new color options are based on suggestions from a number of facility interior designers and represent a palette of neutral colors that can accommodate a wide range of design aesthetics. The fabric choices are from the highly acclaimed Guilford of Maine, Spinel and Anchorage lines of acoustical fabrics. Auralex’s ProPanels are fabric-covered absorbers designed to provide an upscale look with the high-performance absorption qualities that reduce unwanted room reflections (slap and flutter echoes, for instance) to improve the listening environment while affording tasteful aesthetics that complement any décor. 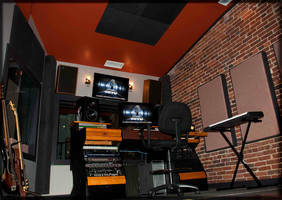 ProPanels are the perfect sound absorption solution for commercial, house of worship or recording studio installations. ProPanels meet the Class A fire rating and are available in a choice of two standard color/fabric options of Sandstone and Obsidian and 12 new Premium color/fabric options. ProPanel standard sizes include: 2'x2', 2'x4', 4'x8' and 4'x4' wall panels (with beveled or straight edges) and 2'x4' corner panel (with reverse-mitered edge). The 2'x2' and 2'x4' wall panels are available in 1" and 2" thicknesses; the 4'x8' and 4'x4' wall panels and 2'x4' corner panel are available in 2" thicknesses only. Additionally, Auralex offers a wide variety of installation hardware: flat Impaling Clips (standard with all ProPanel orders) 1" and 2" offset and corner impaling clips, Z-Clips, Cloud Anchors and Snap-On Anchors (available upon request). For more specialized needs, Auralex offers its Custom ProPanels, which can be customized with regard to shape, size and thickness, to serve the diverse demands of today’s sound professionals. Additionally, Custom ProPanels are available in a wide variety of custom fabrics.